Recent rumors of a new wave cutting supplement from earlier this month have been confirmed, and with Muscle Sculptor deep in the testing phase, early feedback sounds promising. The development team aimed to create a formula that provided next generation muscle gains coupled with the latest in fat loss drivers to help boost muscle gains and chisel away unwanted fat. With an eye on the future, the team developed Muscle Sculptor with an ingredient panel not seen before, one that includes both muscle mass gains and fat loss benefits. This implies that the formulation could be a serious value to those seeking a lean chiseled physique as it loads two of the latest potent products previously only available separately into one fully dosed muscle sculpting stack. The first round of product testers has cited positive results, attributed largely to the unusual inclusion of Laxogenin. While most cited improved fat loss while maintaining muscle mass, as to be expected with what we currently know of the formula, standout cutting feedback included visceral fat loss from stubborn areas (think lower abdomen) and long-lasting, even energy with noticeable appetite suppression. Perhaps the biggest advantages noted by testers were improved muscle recovery and overall strength, both of which typically decrease during a cut. Users also mentioned improved muscle hardness and water loss, further chiseling their physique as fat levels decreased. One user even ran a cycle at caloric maintenance and still saw significant shredding and definition while losing just two pounds overall. Word is that Muscle Sculptor has headed into manufacturing as testing results exceeded expectations. Make sure you subscribe above to updates to learn exactly when Muscle Sculptor and other new products will be hitting shelves at Strong Supplement Shop. Hi Matt- Thank you for your comment. The feature set contained in Muscle Sculptor has been demanded by our customers for a long time. 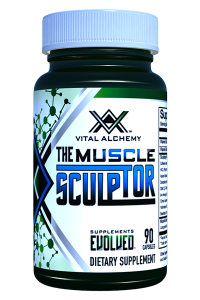 We’re being told Vital Alchemy, the maker of Muscle Sculptor, has fully dosed each ingredient to assure potency. Mind you, no supplement is a silver bullet, but Muscle Sculptor appears to give you a good shot toward making your fitness goals. Hi David – Thank you for your question. True Shred is a much more intense product developed for more experienced bodybuilders. True Shred contains 3 fully dosed anabolics, a test booster and estrogen blocker to start with. True Shred is dubbed “A Hybrid Shredder” because it contains natural anabolics as well as 7-keto and an aromatase inhibitor. Muscle Sculptor contains a powerful natural anabolic as well as an intense fat burner and is created for those who want to build muscle and lose fat. You can see the full ingredient panel here: True Shred. At the time of this response the ingredient panel for Muscle Sculptor has not yet been released by the manufacturer. Sounds exciting! Questions: how does it affect the liver? Can it be used as PCT? Gerhard – Thank you for your question. Just to be clear, almost everything you take orally is processed by the liver, whether its foods, supplements or otherwise. Muscle Sculptor compared to most synthetic anabolics is less harsh because its anabolic, Laxogenin, is botanical based. Laxogenin does not require a PCT. To answer your question though, I don’t believe Muscle Sculptor will serve you well as a PCT. Can you stack muscle sculpture with a true shred? Hi Tony – Thank you for your question. Yes, you can stack True Shred and The Muscle Sculptor. We have more than a few who do and report good results. That said, many more customers stack True Shred and Alpha Lean-7 and also report good results. I think if you are looking to drop weight faster, then Alpha Lean-7 may make more sense. Next PostDo You Seek A Picturesque Physique?